There aren’t many things we like more than fresh, warm cornbread. And believe it or not, cooking up that golden, delicious dough is faster and easier in a waffle iron! These savory treasures are a fun twist on classically sweet waffles, and we had a ton of fun using our waffle iron for something other than breakfast. We added jalapeños to ours for a little extra kick, but you can easily omit them to make this dish more kid-friendly. Top them with chili, cheese, and sour cream, and you’ve got a fun and festive meal filled with Southwest flavors! Turn on waffle iron, allow to heat up and grease with nonstick spray. In a large bowl combine flour, cornmeal, baking powder, baking soda, paprika, cayenne, and salt. In a separate bowl combine buttermilk, egg, and melted butter, then mix in cheddar, jalapeño and green chilies. Add appropriate amount of batter for your waffle maker, close and cook until golden brown, approximately 5-10 minutes. Remove cornbread waffle and repeat with remaining batter. 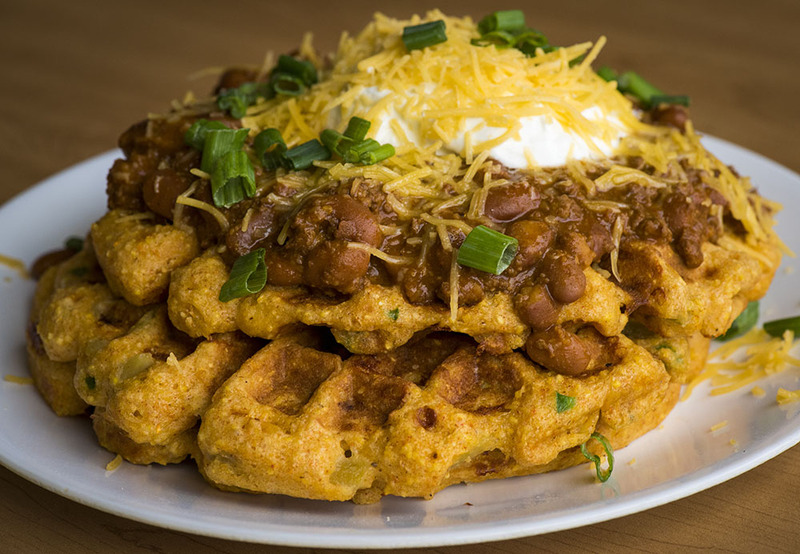 Top each waffle with desired amount of chili, cheese, sour cream and cilantro.